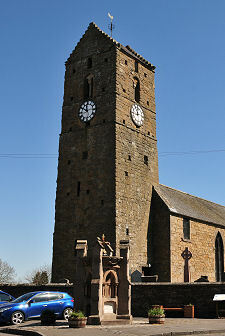 Standing in the heart of the attractive Perthshire village of Dunning is St Serf's Church. Partly dating back to about 1200, St Serfs is cared for by Historic Environment Scotland. 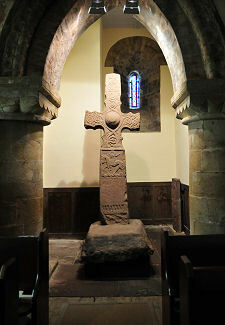 Well worth visiting in its own right, St Serf's is also home to the beautiful Dupplin Cross, carved in about 800 and dedicated to one of the last Kings of Pictland. St Serf's Church was built in about 1200, probably by Gilbert, Earl of Strathearn, and its income was awarded by him to the Augustinian Priory at Inchaffray. The site was chosen because of its association with St Serf, a Christian missionary in the 500s. 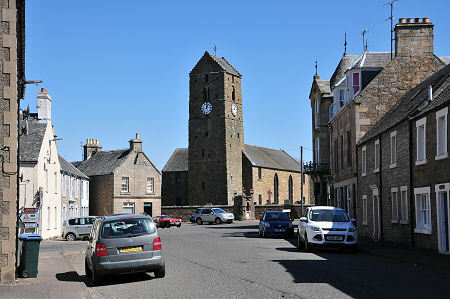 The 75ft Romanesque tower remains much as it would have been when the church was originally built, albeit with the addition in 1890 of clocks on its four faces. As built, the remainder of the church comprised a nave intended for the worship of local residents, and a narrower, lower-roofed (and almost square) chancel, probably separated from the nave by a chancel arch. Nothing remains of this, but the original arch that does survive between the base of the tower and the nave gives and idea of how the rather larger chancel arch might have looked. Rather more extensive changes followed in the years between 1808 and 1810. A large new aisle was added projecting from the north side of the church; the south wall was rebuilt; the chancel arch was removed; and a new roof was added to the nave and chancel. The effect was little short of a complete rebuilding of the church except for the tower. The result was the loss of any distinction, externally or internally, between the nave and the chancel, while the new north aisle gave the church a "T" plan of the sort then so much in vogue in Scottish kirks. This was reflected internally with the fitting of three galleries, one in each of the three arms of the church, while the pews in the ground floor all faced inwards, towards the pulpit which stood in the centre of the south wall. When the church reopened in 1810 it could accommodate 1,000 people. 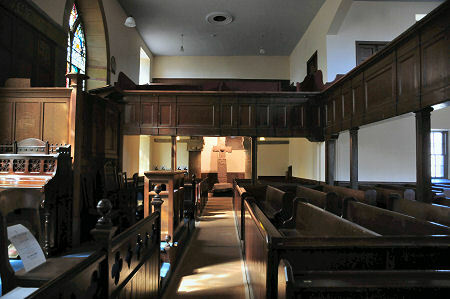 A number of more minor changes followed, including the addition of a communion table in 1895 and a pulpit which previously stood in a church due for demolition in Auchterarder in 1914. 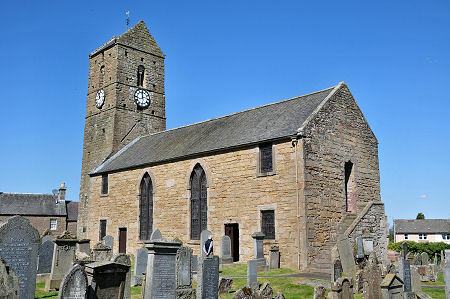 St Serf's continued to serve as Dunning's parish church until 1972, and was placed in state care in 1978. Today St Serf's receives a steady stream of visitors. The church itself is a remarkably complete Presbyterian kirk with beautifully preserved woodwork. It also has an unusually striking collection of stained glass windows, mostly installed between 1895 and 1907. For anyone fond of a mystery, the most interesting is the most westerly window in the south wall, near the base of the tower. This was installed in 1899 in memory of "John Whyte and May his wife". 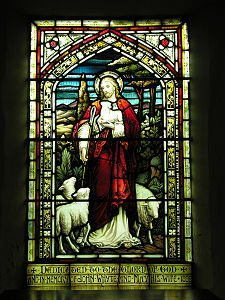 This illustrates the Lord as a shepherd. 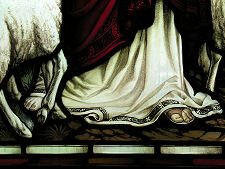 The mystery comes from the depiction of his right foot. This is bare, in contrast to his sandalled left foot; it seems smaller and lighter in shade than his left foot; and it actually seems to be shown in the wrong place, to the right of where it ought to be, given the stance of the subject. But, to be honest, not many people who reach the west end of St Serf's Church have much attention to spare for the stained glass, because your attention is monopolised by the beautiful, and beautifully presented, Dupplin Cross, which stands in the base of the tower. 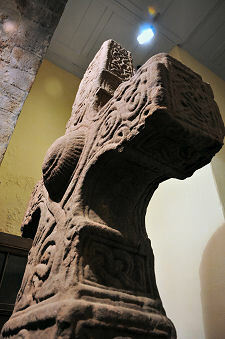 The Dupplin Cross stands nearly 3m high, and until 1999 stood on a hillside overlooking the site of a Pictish royal palace at Forteviot, 3 miles north east of Dunning. 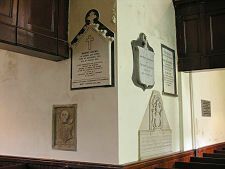 After a period of conservation it was placed on display in St Serf's Church in 2002. During conservation a Latin inscription which had previously seemed too eroded to read was shown to dedicate to cross to "Constantine, son of Fergus". Constantine ruled Pictland from his palace at Forteviot from 789 to 820, and was one of the last Kings of Pictland before its assimilation into Alba by Kenneth Mac Alpin or Kenneth I in 843. 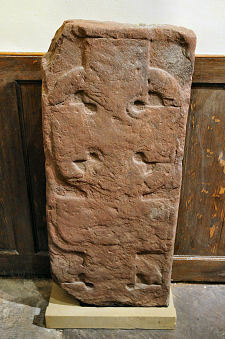 The Dupplin Cross is one of the most finely carved and detailed stone crosses you will find anywhere. Some features seem familiar to anyone who has seen the surviving stone crosses on Iona, while others owe more to Northumbrian art. Every surface of the cross is carved with the exception of a triangular area near its base. The excellent Historic Environment Scotland brochure available at St Serf's unravels all the various elements, but a number are especially striking. The carving on the cross is divided into two main parts. 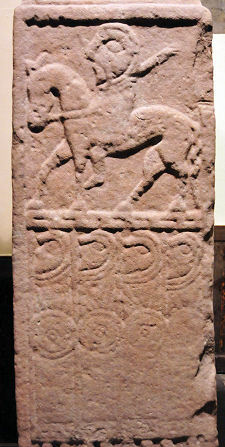 The decoration of the cross itself is largely abstract in origin, employing a number of different designs and patterns commonly found on other Pictish stones. The shaft of the cross, which is carved to be quite distinct from its head, is formed by a series of panels, many of which carry carvings of figures. The front or east side of the shaft of the cross carries a carving of a mounted figure assumed to be Constantine himself. Below him are four warriors with shields and spears, while the bottom of this side carries a depiction of hunting dogs. The rear or west face of the shaft carries the panel with the Latin inscription above another with an abstract design. The bottom panel on this side shows a figure and a dog with three beasts: possibly intended to be King David and the lions. One side of the shaft includes a panel with two more warriors with shields, while the other includes a panel showing a figure playing a harp. This is also believed to represent King David, based on a Biblical quote. Also in the base of the tower, and almost overlooked next to the Dupplin Cross, is a Pictish gravestone that probably dates back to the same era as the cross itself. While you are at St Serf's it is also well worth wandering around the churchyard. A number of the graves still standing here date back to the 1600s and you will find many of the traditional Scottish gravestones from the 1600s and 1700s displaying emblems representing the mortality or the trade of the person they commemorate. 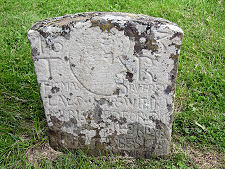 Of particular interest is the Rutherford Stone, commemorating Thomas Rutherford and dated 1623. This is the oldest stone in the churchyard and carries a very unusual variant of the common symbol of a skull: shown very crudely in profile and looking more like a modern cartoon character. Elsewhere in the churchyard is another extremely unusual but much more modern gravemarker. Many churchyards have one or more cast iron gravemarkers. These usually have no trace of any dedication, and leave you wondering whether those buying what were obviously sold as the "latest thing" knew just how fast they would corrode. 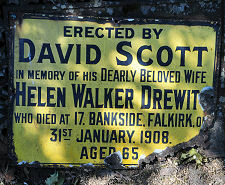 The grave of Helen Walker Drewit, who died on 31 January 1908, is the first we have seen that still carries the enamelled metal plaque - very like an advertising sign of the same era - giving the details of the person buried there.